Yahoo was the leader of the instant messenger market in the early days of the internet when its instant messenger- Yahoo Messenger was in full swing. As years passed by, social networks came along with mobile instant messengers like WhatsApp and Skype, and Yahoo IM began to lose its market share. Facebook-owned WhatsApp now owns the largest market share at the moment followed by other IMs. Yahoo has recently launched its new instant messenger at the iTunes store in Hong Kong. This new IM from Yahoo called Yahoo LiveText brings a new kind of messaging experience to the table. We can say that Yahoo has been a little late to launch such an IM but it surely looks promising. Yahoo LiveText went live on Hong Kong iTunes App store earlier this month and offers video messaging without an audio stream. It’s basically a traditional IM supporting text messages along with GIF like video messages. This will let the users express their emotions with their friends, family, and colleagues in a much more intuitive way where they can see each other’s reaction in real-time. “It ‘s live video texting, without sound. 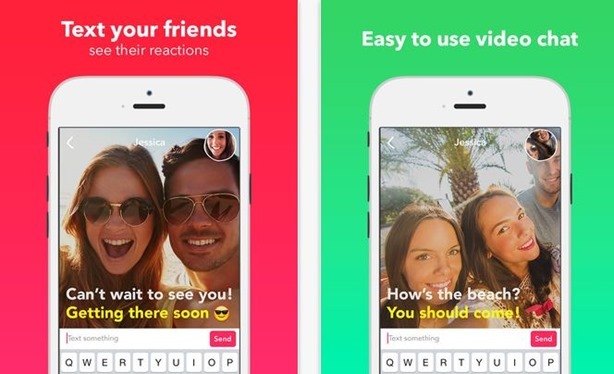 You will feel like your friends are right there with you,” reads LiveText description. What’s Yahoo Been Doing All These Years? Yahoo has been constantly trying to replace its aging Messenger app for the past few years and also tested quite a few apps but sadly none of them made the cut. It has also been on a mergers and acquisition spree in the recent past when it acquired quite a few startups for adding more talent to its core development team of its next instant messenger. This silent unveiling of the LiveText app on Hong Kong iTunes App Store hints that the app is already in public-testing phase and will be rolled-out to other markets soon. What Are Yahoo’s Plans With LiveText? Yahoo plans to regain its market share that it lost to various popular messaging apps like WhatsApp, iMessage, SnapChat, Hike, Line, Telegram, etc. And since it is late to the market with its latest IM offering it had to offer something new and unique. Yahoo LiveText is a traditional IM but supports video messages. Sadly it doesn’t offer video chatting like the other famous IMs at the moment, but we all know how interesting and persuasive GIFs can be. “LiveText is an entirely new way to stay in touch,” the company claimed. The company worked on the simple idea that text messages aren’t enough for expressing deep emotions and audio messaging isn’t always possible in this fast-paced world. Yahoo LiveText can be used either on mobile data or a WiFi connection but is limited to one-on-one chat at the moment and doesn’t support Chat Rooms, the popular feature of the Yahoo Messenger. It also comes with support for unique personal ID as Livetext ID letting the users find friends based on their phone contacts. It remains to be seen how popular this silent video messaging app can be, but it’s good to see some variation from the regular IMs. There is no word about its Android and international release at the moment but we’ll let you know as more information surfaces.